Yippee!!! It's Just Add Ink's 300th challenge! We'd really love for you to play along with us this week in our massive milestone challenge. Some of our design team have donated 3 fab prizes for this special occasion - one for our top pick and one for each honorable mention. I'm really enjoying this sweet 'Hello', you might remember I used it in a similar way a few weeks ago here. 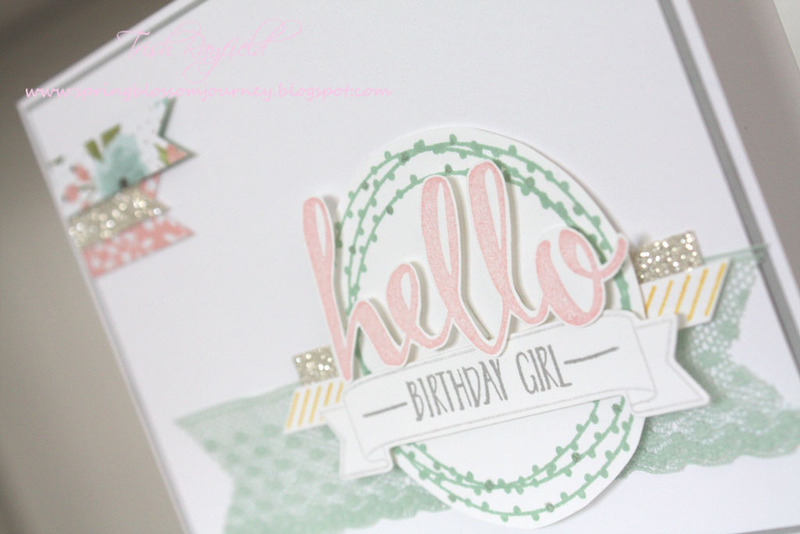 The little tiny DSP flags add that little bit of pattern that I think this card needed! You can't really see from the pictures but I've dotted some wink of stella on the dotty circles in the background. 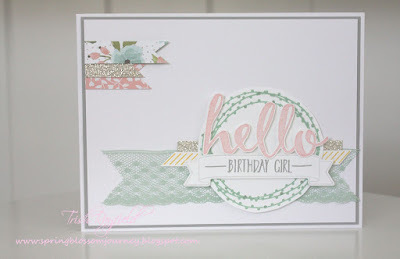 I'm so proud to be here on the JAI Design Team for their 300th challenge! I'm certainly not one of our longest standing members but I have been here since challenge #104 and my goodness hasn't my paper crafting evolved since then! Ha! We'd really love you to join in the celebration and enter your creation here. Oh Trish, this is so soft & sweet & pretty. I bow to your fussy cutting awesomeness again & love the little group of stripy, sparkly elements on that lovely wreath shape (which I sooooo want to order but am trying to be good. Love it!